French Bulldog Colors - All The Colors A Frenchie Can Have! You are here: Home / Breeds / Pure / French Bulldog Colors – All The Colors A Frenchie Can Have! French Bulldog Colors – All The Colors A Frenchie Can Have! French Bulldog colors are just one fascinating aspect of this smart, affectionate purebred dog’s appeal. The original French Bulldog was an unofficial mascot of sorts for a very unusual industry – lace making! As the lace-makers of Nottingham in England migrated to France in search of clients, they brought their petite Bulldogs with them. French locals were charmed by these tiny pups and eventually they evolved into a true Parisian sensation. When the Frenchie crossed the pond into America, Americans fell in love with them as well. In this article, we take a closer look at French Bulldog colors, patterns, and genetics to learn more about this popular companion breed. 1897 was a big year for French Bulldogs and their admirers, because this was when the first official American Kennel Club (AKC) breed standard was published. In this first breed standard, the AKC stated that dark brindle and dark brindle and white were preferred. All other brindles and all other colors were permissible. This was an admirable first effort. But many aspiring French Bulldog breeders felt this early breed standard lacked detail. As of 1991, there was one further revision to the color portion of the official breed standard. This revision noted that white with black was also disallowed. For those outside of the world of French Bulldog breeding, reading about French Bulldog colors such as “mouse” and “liver” or “fawn” and “brindle” can be understandably confusing. But in the French Bulldog color chart that many breeders and competition show judges use, these colors mean something other than a species of wildlife or major body organs! Deciphering and interpreting French Bulldog colors can become a bit confusing, especially since certain colors and patterns tend to look a lot like certain other colors and patterns until your eyes learn to see the differences. The fawn color has a wide range from dark to light. Some people mistake fawn for French Bulldog colors tan, brown, beige or crème. A real fawn color has a slight red cast to it. To understand brindle, you first need to understand fawn. Brindle is technically not a single color but actually a color pattern made up of fawn and black hairs. The brindle color can also have white mixed in. The amount of each color can greatly change how a brindle coat appears. The color “mouse” actually means gray. Specifically, it means a dilute grey that often appears to be blue gray, slate blue or steel gray. This color is disqualified from AKC show standards. What makes mouse a confusing color is that it can also appear as part of a pattern such as brindle. The presence of the mouse-colored hairs is a disqualification in the show ring, but it can take a trained eye to detect these hairs! The color “liver” means a color on the brown spectrum. Often there is a hint (or more than a hint) of red or rust mixed in. Liver can be very hard to distinguish from certain shades of fawn or cream unless your eye is trained to tell them apart. Often, the telltale sign is in the dog’s nose color. The big wide world of French Bulldog colors and patterns can quickly get confusing, especially for newcomers! Here is a simple breakdown of allowed and disallowed AKC French Bulldog colors. These are the most common and also the only accepted French Bulldog colors. Here, we look at just single colors and in the next section here we look at common French Bulldog colors and markings. French Bulldog colors white: the white color, thankfully, is one that even newbie French Bulldog enthusiasts can usually spot straightaway. French Bulldog colors fawn: French Bulldog colors cream and fawn are often mixed up. In truth, they can look quite a bit alike! Both are also accepted in the official AKC breed standard. Fawn can occur on its own or with a pattern such as brindle or piebald (pied). If you thought French Bulldog colors were complex, wait until you learn about markings! The brindle is arguably the most popular French Bulldog color. Brindle is sometimes mistakenly called a coat color, although in actuality is a pattern formed of two or more different coat colors. The brindle coat pattern can be quite varied and can also occur in patches with another solid coat color such as French Bulldog colors black brindle or French Bulldog colors brindle and white. The piebald, or pied, French Bulldog colors are considered somewhat of a stretch goal to serious breeders. It is a challenge to breed pied puppies reliably! To further complicate matters, it is possible to have a Frenchie who sports more than one color pattern, such as a piebald brindle. A well-bred pied French Bulldog will display a partial or a complete face mask offset by a different main body color and well-placed complementary body marks that match the face mask. A coat is “ticked” when there are small areas of white in which spots of color appear. As with many popular purebred dog breeds, the official breed standard is considered the premier resource to determine appropriate French Bulldog colors. The breed standard is updated periodically and dictates whether a French Bulldog can be shown. But sometimes disallowed French Bulldog colors, patterns or markings are not permitted for reasons beyond simple appearance. They may impact the health of the breed. Unfortunately, the most expensive French Bulldog color often should not have been bred in the first place. It may also place your new puppy at risk for lifelong, life-limiting health issues. The French Bulldog Club of America has issued guidelines warning puppy shoppers against “fad” or “rare” colors for this very reason. French Bulldog breed clubs around the world issue guidance about French Bulldog colors and patterns to help puppy buyers identify reputable, responsible French Bulldog breeders who put puppy health first. Serious breeders generally use a French Bulldog color genetics chart to help guide and track their breeding efforts. This is especially helpful when a breeder decides to specialize in certain French Bulldog colors or patterns. But paying close attention to French Bulldog color DNA is also important to ensure breeding of healthy puppies with excellent quality of life. The same genes that influence French Bulldog colors and markings often also influence other developmental processes in dogs, such as the development of healthy vision or hearing. Here is some basic information about French Bulldog color genetics and health to keep in mind, especially if you are seeking a puppy! The gene that produces an all-white solid coat has a well-documented association with canine deafness. The eyes are often blue, which is also associated with canine deafness, as well as with additional eye problems. 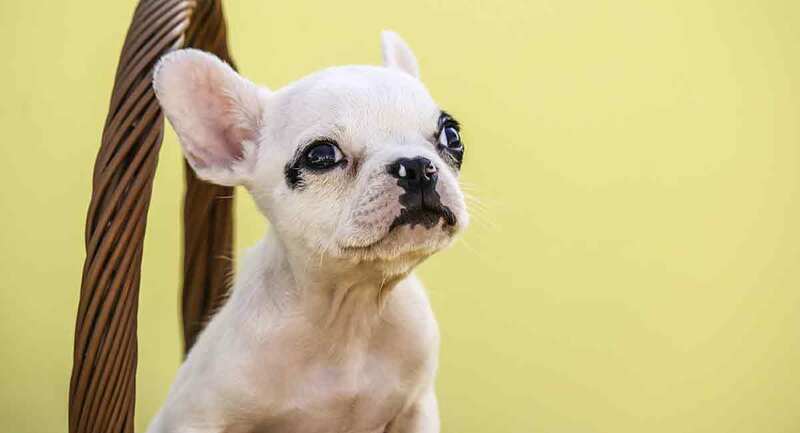 French Bulldogs with significant white markings and patterns where there is no brindle present can also be at risk for canine deafness and eye problems. The gene associated with the mouse color is linked to cataracts, blindness, persistent hair loss and other skin issues. Affected dogs often have a yellow or blue cast to their eyes. The gene associated with the liver color is linked to early life cataracts and alopecia. Affected dogs often have a yellow cast to their eyes. The merle gene has a well-known link to eye issues, including missing eyes or eye abnormalities, like nonfunctional or smaller than usual eyes. Linked ear issues include deafness in one or both ears. What are the best French Bulldog colors in your opinion? Do you have any favorite French Bulldog colors? Please share your favorite colors in the comments section! Dykes, S., et al, “French Bulldog Fad Colors Explained,” The French Bulldog Club of America, 2019. Rankine-Parsons, P., et al, “What Colour Should My French Bulldog Be?,” The French Bulldog Club of England, 2019. Grebe, J., “FRENCH BULLDOG COAT COLORS and the BREED STANDARD Historical Perspective,” American Kennel Club, 2018. Gravestock, C., “Pied French Bulldogs – Coat Color Inheritance,” Bull Market Frogs Kennel, 2017. Bell, J.S., DVM, “Practical Genetics for French Bulldog Breeders & Owners,” Tufts University/Cummings School of Veterinary Medicine, 2008. Hedberg, K., BVSc, “French Bulldog Coat Colour Genetics,” French Bulldog Club of NSW, 2008.